How to Cut Mosaic Tiles Archives - Blog | Red River Precision Mfg., Inc.Blog | Red River Precision Mfg., Inc. Simply put, Waterjet cutting involves a very high pressure stream of water directed at a material intended to be cut or engraved. The force generated by this jet of water facilitates easy manipulation of the base material and the precision to create not just straight cuts but a number of patterns and motifs. Often the jet of water is mixed with abrasives, and this stream is used to sculpt harder materials like tiles, metal and ceramic. The water-only jet is ideal for more pliable substances like rubber. Why is Waterjet Cutting Preferred? First and foremost, Waterjet cutting is a technology that works very quickly – almost five times faster than Wire EDM when used on sheets that have a relatively low thickness. This applies to both custom pieces and bulk processing. Waterjet technology is quite affordable and largely relies on the skill of the handler for optimal results. Most importantly, when a jet of water is used there is no distortion of the material that is being worked on. There is no visible “Heat Affected Zone” (HAZ) and the properties of the compound don’t change either. Waterjet cutting is versatile, taking on everything from glass, rubber, and mosaic to carbon reinforced plastics. 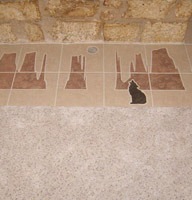 A unique application of waterjet cutting has been found in architecture, as waterjet cutting is used to shape and mark mosaic tiles. The design process is carried out in two parts. The primary pattern is developed using sophisticated CAD technology. Once this blueprint is created, the waterjet equipment is programmed to follow its specifications for unparalleled accuracy and precision. The end products stand up to stringent quality checks and comply with dimensional restrictions. Want to know more about our Waterjet Cutting services? Feel free to call 512-244-1508 for details.